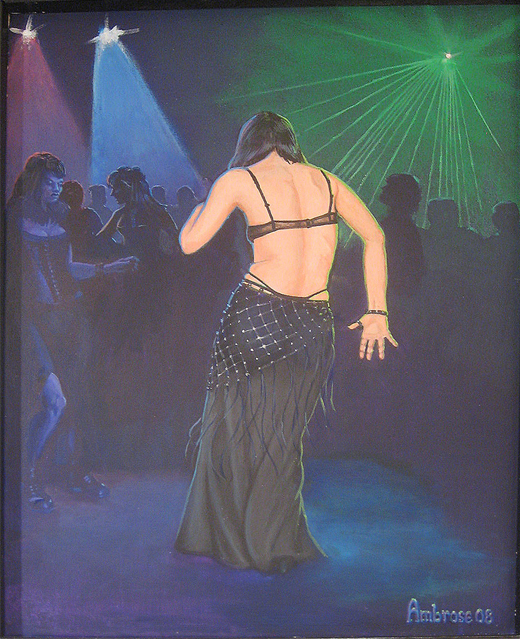 This is a recent (2009) painting based upon my observations, during the past 18 yers, of beautiful dancers at clubs of the gothic-industrial scene in NY/NJ. This particular beauty was a prominent scene figure frequently present at various clubs in northern NJ, noted for her exceptional dancing skills. Here she appears in her most feminine persona. At other times she could be seen in tough attire and punkish, flat work boots.